What is all sin tan cos rule? 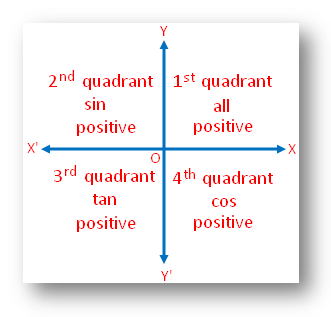 All sin tan cos rule is all trigonometrical ratios in the first quadrant, only sin (and cosec) in the second quadrant, only tan (and cot) in the third quadrant and only cos (and sec) in the fourth quadrant are positive. (i) When the θ lies in the first quadrant: All trigonometrical ratios of the angle θ are positive. (ii) When the θ lies in the second quadrant: Only sin θ, csc θ are positive and the rest are negative. (iv) When the θ lies in the fourth quadrant: Only cos θ and sec θ are positive and the rest are negative. Therefore, the above rule for the signs of trigonometrical ratios is also known “all, sin, tan, cos” rule. 1. The relations of all the trigonometrical ratios of a positive acute angle and angle θ can either be positive or negative. 6. Tan θ and cot θ can have any real values.